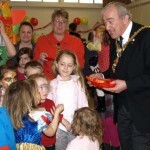 Following last year’s success we are holding again a Party to celebrate Chinese New Year. Games and activities, snacks and gifts for the children, refreshments and chat for the parents, Jilly Jellybean will be face painting again and modelling with balloons. On display will be the final plans for the new Community Centre, There is also an opportunity to give your views on how best to refurbish Quarry Bank High Street, please take a moment to tick the boxes on these Community Development Plan consultation documents. This event is from 2.00pm until 5.00pm admission is free.